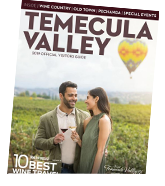 Temecula Valley Southern California Wine Country offers a variety of wedding vendors for your special day. Arrive is a luxury limo to make your grand entrance or for more of a classic entrance, a horse drawn carriage. Remember to pamper yourself with a deep tissue massage before the wedding. Whatever your plans are, Temecula Valley can help you achieve your dream wedding.